BEFORE: The next two films on the list deal with some aspect of pop culture. 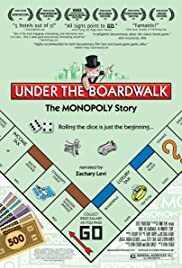 Today’s film, Under the Boardwalk: The Monopoly Story, is pretty self explanatory. I don’t play Monopoly that often, but I am very interested in learning more about strategies and how professionals play the game. AFTER: I’ll preface what I’m about to say with this: I learned pretty much all there is to know about Monopoly. I’ve played the game before and thought I knew what was going on, but it turns out there is a whole realm of players and knowledge that was unknown to me. That being said, I didn’t like the documentary. It attempts to show the many global and cultural connections made through Monopoly. In reality though, these connections don’t exist; at least not to the extent that the documentary makes you believe. Sure it can bring families and friends together when they have a game night or some other get-together, but this film tries to present Monopoly as the linchpin to all human connections and I just don’t see that. And the film was just way too bloated with unnecessary information and footage. Yes, I learned quite a bit, but I think the same information could have been presented in a short, five minute YouTube video such as one of these videos by C. G. P. Grey. The other component besides the history and brief explanation of strategies, was the U.S. National and World Competitions. The filmmakers tried the best they could to make the gameplay as interesting as possible, but the nature of the game lends to an uninteresting video. It’s exciting to the people playing, and maybe those watching the whole game as they can see the strategy and history of each player’s moves, but not to someone watching an edited version. And it probably was the most interesting they could have made an edited version of Monopoly, a game which can last as long as the documentary (and the longest game ever lasting 70 straight days). It was a promising concept, but the execution failed, mostly due to the nature of the game itself.